“Congratulations! You have been selected as a finalist in the 2015 Creators and Innovators Upcycle Contest…” The words in the email to my son Connor began a series of events that led to one of the shortest, yet most meaningful trips I can remember. 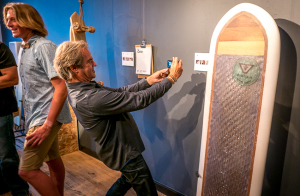 Vissla, the surf clothing company sponsoring the competition, requested all the finalists ship their boards to an art gallery in San Clemente, CA where they would be put on display. In addition, Vissla invited all the finalists to attend the show opening at the gallery during which time the winners would be announced. 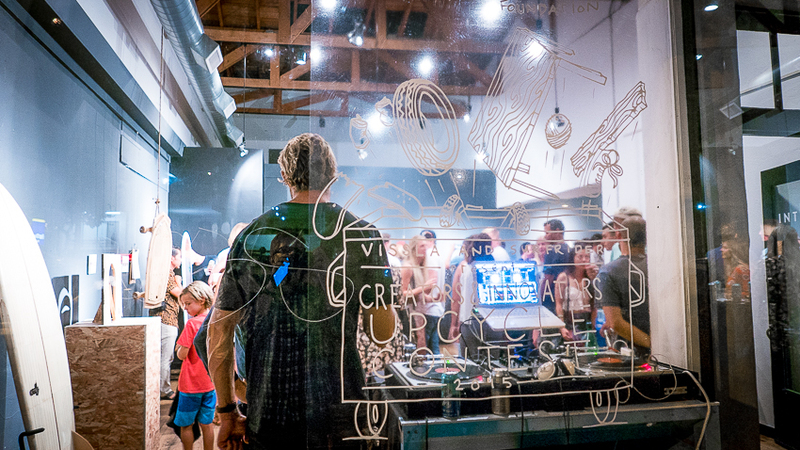 Vissla covered the cost of shipping the board and a hotel room for the night of the event. But Connor still had to fly down there and somehow make it to the event. I could tell this was a big deal to Connor. And since his 18th birthday was coming up right before the event, we decided to splurge. 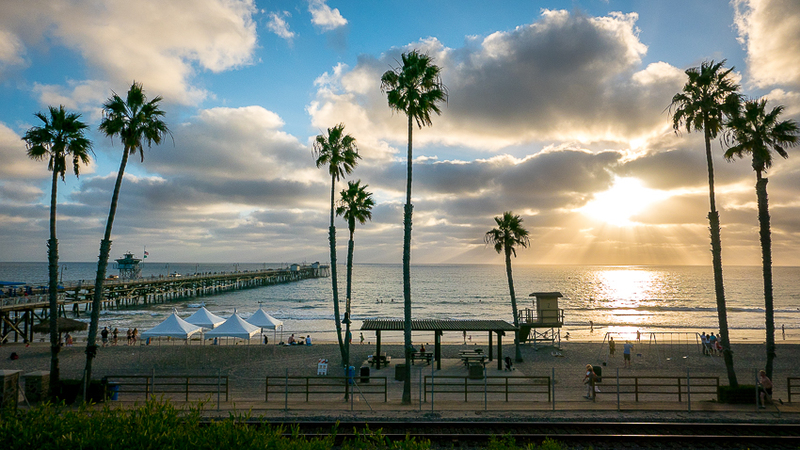 Thus, in early October, Connor and I landed in San Diego, picked up a rental car, tooled around San Diego, had lunch out on Coronado Island, then leisurely made our way up the coast to San Clemente. There, we checked in to the wonderful, funky, surf-themed Nomad Hotel that Vissla had arranged. 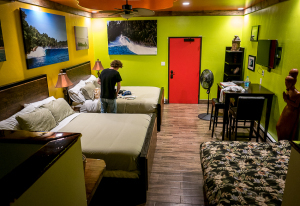 On one of the beds was a bag filled with Vissla clothing and gear, all in Connor’s size. From there, we drove down to the San Clemente pier, looked around then arrived at the gallery as the opening was starting. We met with the team from Vissla, all of whom were wonderful, welcoming and so glad we could be there. Vissla’s story itself is fascinating. Founded by Paul who was previously head of all the North and South American operations for Billabong, the company primarily produces surf clothing. But Paul, a former pro surfer, has a passion for “Creators and Innovators.” He honors not just those who practice the art of riding waves but also those who create the boards and equipment needed to do so. This whole competition surprised everyone at Vissla in its popularity. Being the first time they’d done this, Vissla expected a few entries from locals. Instead, they had hundreds from all over the world. What made the evening so fascinating was that wonderful phenomena that occurs when people of passion come together. The gallery was packed, spilling onto the sidewalk with a wide array of people, all connected by a love of the sport. This is a view of the gallery from the sidewalk that ended up overflowing with people from the opening. As we met and spoke with each of the finalists, it was clear that no one really cared who won. Everyone was just glad to be there and to share ideas with each other. Each contestant was genuinely interested in everyone else’s entry, from the functional board made of cardboard and Paper Mache (and covered in fiberglass) to the fins made from recycled plastic bottle caps melted and reformed into objects of beauty. By the end of the evening, Connor and the others were all figuring out ways to connect and work on new projects after the event. 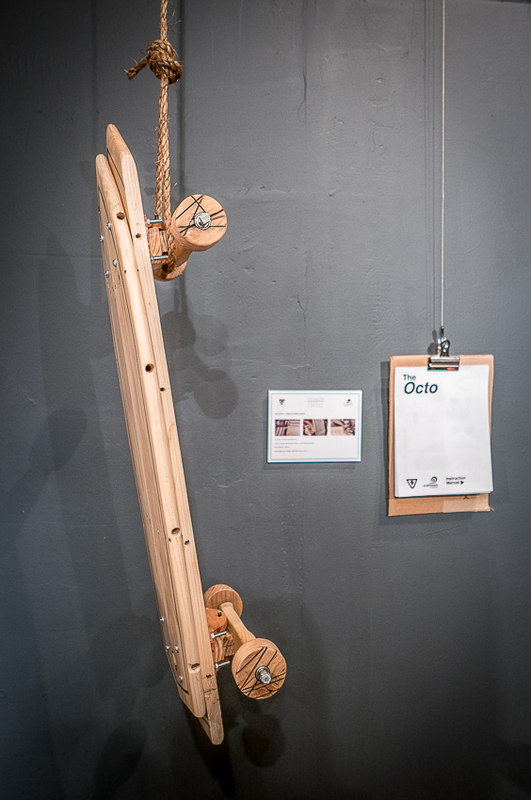 Connor’s board in the longboard mode hanging in the gallery. Eventually, a team of judges made their determinations and they announced the winners. First place went to Dane from Australia for a board that used the inner core from old doors but combined with foam and fiberglass in such a way as to be a work of art. Second place went to a guy from Japan who made this amazing board from recycled Styrofoam cartons used in that country for transporting raw fish. Third place went to…Connor! For that, he won one of Vissla’s cool wetsuits. Everyone agreed Connor had one of the most original ideas. 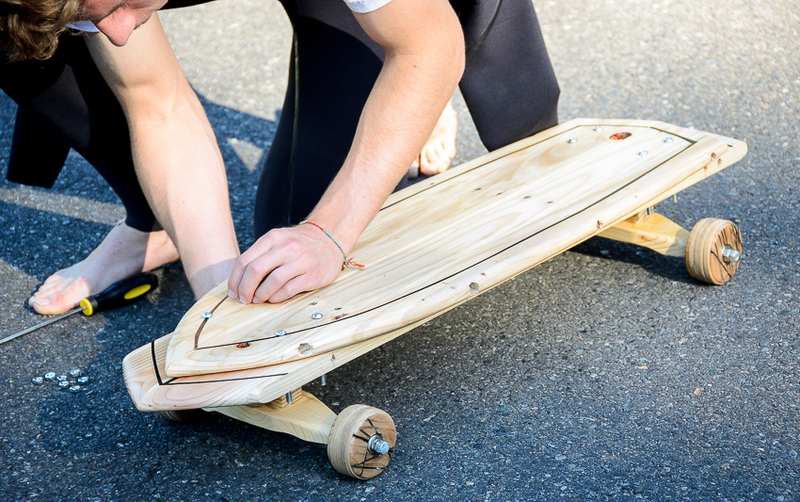 They loved that even the wheels on his board were made from pallet material. They especially liked how detailed his user’s manual was. “Ikea could learn a thing or two from you,” was a common refrain that evening. 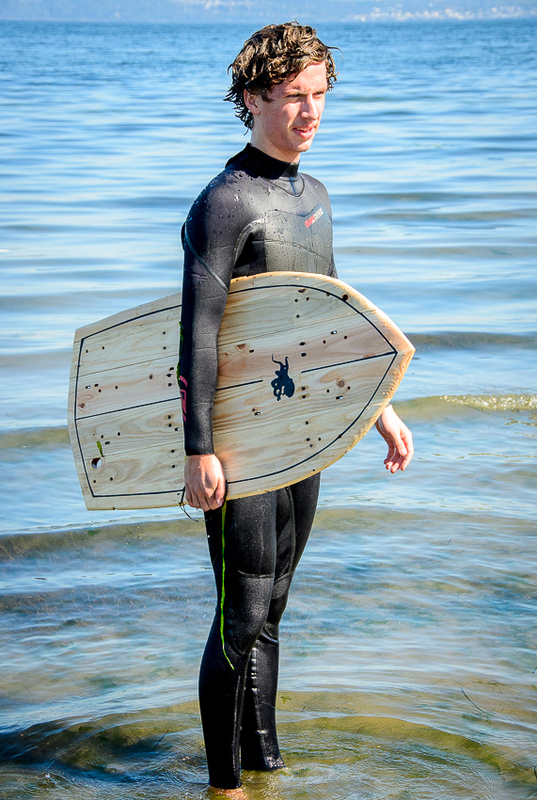 Later that evening, Vissla approached Connor and offered to buy his board for their corporate art collection. He eventually agreed to sell them the board. He plans on using the money to fund his start-up company making other kinds of long boards and surf t-shirt designs. To me, a conversation I had with the board designer/shaper Donald Brinks epitomized the evening. Donnie and I got to talking about creativity and the design process and how everything is connected. How you learn something in a seemingly unrelated area, and it sparks an idea that would seem completely unconnected but makes total sense once you put the two together. 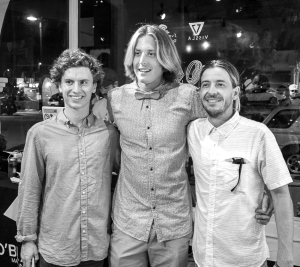 Connor (left), Dane (center) and Eric from Vissla. He commented on how you know a surfboard is right when you pick it up. I likened it to choosing a guitar. You can’t explain why, but you just know it is the right one by the way it feels or sounds or some other inexplicable factor. All the “data” you’ve spent a lifetime collecting suddenly connects in that moment and you know beyond doubt that this is the right one. That’s the way this evening – this whole trip – felt. A vast array of interests and unlikely connections came together and worked in ways that amazed Connor and me because they were so unexpected and yet, so perfect. In all, the entire trip was just over 24 hours. But it is one that will likely last a lifetime. If you haven’t done so yet, you can read Part 1 here.